File Recovery Software. Why R-Studio? Often our prospective customers ask us: What makes R-Studio better than other data recovery utilities? Why is R-Studio called "cost-effective" when some alternative file recovery products actually cost less? Is R-Studio more powerful than other tools? Why does R-Studio seem more complicated than some other tools? Let's tackle that last question first. 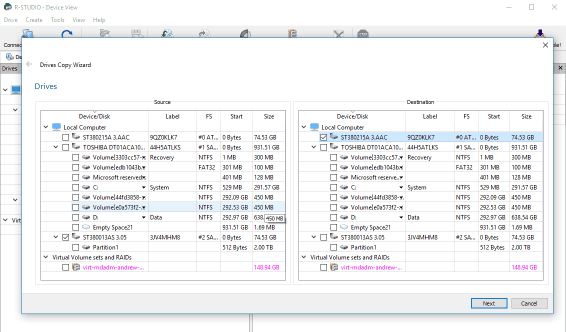 The R-Studio data recovery software was originally developed for use by data recovery experts, system administrators, IT professionals, and advanced and experienced computer users. Some of R-Studio's features were even designed exclusively for computer forensic experts, and most R-Studio users don't need every single feature of the software. Because of the many features presented in R-Studio, there may be inexperienced users who find its interface and abundant functionality a bit confusing. We've actually tried to simplify the software interface as much as possible and have included a detailed online help and manual with the product. However, we recommend to those who still feel uncomfortable with the software after reading the Manual that they start their data recovery experience with the R-Undelete file recovery tool. Its three-step wizard-oriented user interface provides an easier way to perform ordinary file recovery tasks without any compromise to their efficiency. It's the best choice for basic and some advanced data recovery needs. Below you may compare the main features of R-Studio and R-Undelete. Important! Within one year of the date that you purchased your R-Undelete license, you may upgrade it to R-Studio for the initial price difference only. So, for the most simple, common cases, there is no reason, from a savings perspective, to purchase R-Studio before you have tried R-Undelete. 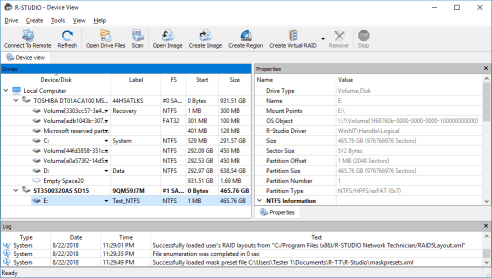 Why does R-Studio cost more than some competitive data recovery utilities? 1. 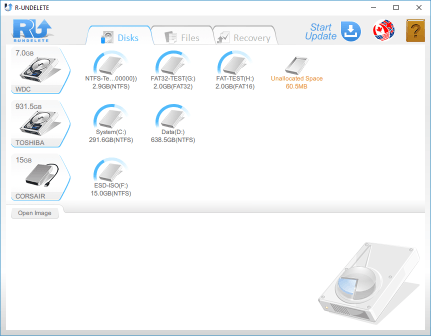 A full-featured data recovery utility capable of solving any task an experienced data recovery specialist or advanced IT professional user may ever meet. 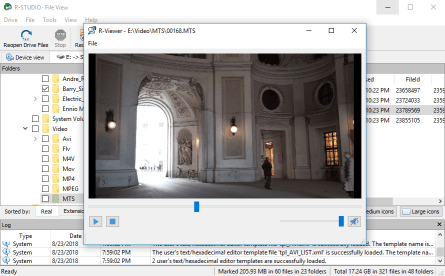 It includes support for Microsoft's new file systems exFAT and ReFS, and Apple's APFS, and uses all common file recovery methods, including scanning for known file types (raw file search). The average market price for software with this capability is US$60.00. A multi-language GUI and help which language can be changed on the fly. Customizable known file types. To increase the chances of recovering very specific files, you can add your own, quite complex file signatures to make finding these files easier. You can add your own known file types by creating a known file type description file. You may learn how to create your own known file types in our article Creating a Custom Known File Type for R-Studio. An advanced file previewer that directly supports a lot of important file files: Adobe Acrobat pdf, Microsoft Office documents doc, xls, ppt (Office 97-2003), docx, xlsx, pptx, and a vast number of multimedia and graphic formats, without their programs or codecs installed. A quite useful feature for determining the chances for recovering files. You can also preview files on a remote computer. An R-Studio Emergency CD. Based on a Linux kernel, this CD allows the user to recover data even if a computer cannot start. There are two versions of R-Studio Emergency: one with a graphical user interface similar to that of R-Studio itself. You may use this version if your graphics card is supported. If not, you may use the second version with a pseudo-graphical interface that is simpler but has the same data recovery functionality. 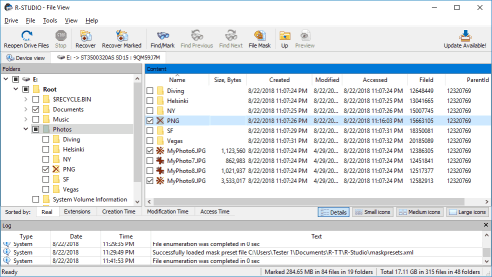 In addition, R-Studio Emergency may be used to completely delete and wipe data on a disk before you dispose of it or give it to somebody else-the functionality worth of a stand-alone application. Read more about R-Studio Emergency in our article Emergency File Recovery Using R-Studio Emergency. Disk imaging. R-Studio can create images, or exact byte-by-byte copies, of any object visible in its Drives panel, be it a hard drive, logical disk, or a complex RAID. Such images are extremely useful in the event the real objects are about to die. You can perform any data recovery tasks using those images. Moreover, you can create virtual objects, like virtual RAIDS, using those images. In addition, such images can be used for disk backup and emergency system recovery. While imaging, R-Studio can simultaneously scan the object. S.M.A.R.T. attribute monitoring. R-Studio can display S.M.A.R.T. (Self-Monitoring, Analysis and Reporting Technology) attributes for hard drives to show their hardware health and predict their possible failures. Data recovery over network. A very useful feature when you cannot, or do not want to, disassemble a notebook or sealed brand-name desktop computer to access its hard drives. Or perhaps the computer's hardware works flawlessly, but you cannot start it because data on the system disk is corrupted? No problem. Connect the computer to your workstation via your network and boot it up with the R-Studio Agent Emergency start-up disc. You then have full access to the disk on the problem PC as if R-Studio were installed on that computer. Or, let's say your computer runs normally but you just need to recover some data on it. Just write R-Studio Agent Portable on any flash drive that's on hand and run it from the flash drive on the computer. And, again, you have full access to the data. No program setup is involved, there is no need to restart, no data is written-and the odds of recovering your data are higher. Furthermore, you can preinstall R-Studio Agents on the computers in your corporate network. And no worries if your rash salespeople delete files and empty the Recycle Bin-only then remembering that their Quarterly Sales Reports were among the deleted files. You get immediate access to the "victim computer" without any program setup, restart, or data written. And remember: R-Studio and R-Studio Agent do not pump those gigabytes of data over the network. R-Studio Agent does the actual data analysis on the computer where it runs and sends only the information on the data to its "mother" R-Studio. Moreover, recovered and other service files (images, scan info, etc.) can be saved on the remote computer without transferring them through the network. Our R-Studio Network Edition package includes five additional R-Studio Agent licenses for remote computers. 2. A RAID reconstruction module. This is no basic RAID recovery feature like the ones offered by most other data recovery companies. R-Studio's RAID recovery module provides advanced and versatile features that rival those of stand-alone array reconstructors. Advanced RAID levels including many nested and non-standard ones. Support for parity delays in all applicable RAID layouts with enhanced parity delay controls. Customizable RAID layouts. You can create arrays consisting of an arbitrary number of disks, complex stripe configurations, offsets, and block sizes. Pure virtual concept. 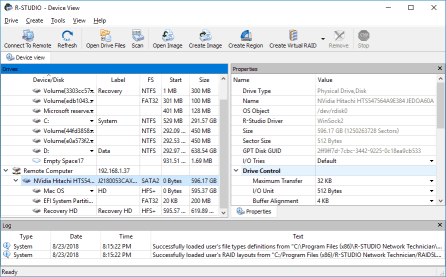 You can easily combine hard drives, logical disks, images, and other objects in the Drives panel to create virtual RAIDS. You can add empty spaces or missing disks as virtual substitutes for missing RAID parts. Flexible parameter editing. You can instantly change any parameters to find the correct RAID ones. Complete integration. Once a virtual RAID object is created, you can have R-Studio start analysing the object's data immediately. You can perform all data recovery tasks. There is no need to copy the contents of the reconstructed RAID object to another media. Reverse RAIDs. This technique enables the user to decompose a real disk object into a virtual RAID. Then those components of that reverse RAID can be processed like real objects. They can be viewed, edited, imaged, copied to physical drives, etc. This technique also can re-construct data on the real parents of a virtual RAID, on a missing disk, for example. Support for Windows dynamic disks (software RAIDs), Windows Storage Spaces (created by Windows 8/8.1 and 10), Apple software RAIDs, CoreStorage, File Vault, and Fusion Drive, and Linux Logical Volume Manager (LVM/LVM2) and mdadm RAIDs. R-Studio can automatically recognize and assemble the components of these disk managers even if their databases are slightly damaged. Their components with severe corrupted databases can be added manually. The average price for such software offered by our competitors is US$80.00. Completely comparable in its features to the leading disk editing tools available on the market. Data on disk interpreted according to data patterns. You don't see just hard-to-comprehend hexadecimal or text data; you also see it interpreted as various data patterns: boot records, MFT, FAT32, files, etc. Custom data patterns. You may create your own data interpretation patterns for your own tasks. You may create such patterns for a new file system-say, for a non-standard video recorder. The average price for such software is US$70.00. You may copy any object visible in the Drives panel directly to any other object, byte for byte. Or you may make a smart copy of a partition or hard drive, adjusting its offset and size on the destination object. The average price for such software is US$30.00. So, now we can do a quick calculation. Separate, single-license products would cost: US$60.00 + US$80.00 + US$70.00 + US$30.00 = US$240.00. The R-Studio local version, with its full feature set, costs just US$79.99; the R-Studio Network package, which includes five additional licenses for remote computers, costs just US$179.99. R-Studio has the advantage of offering you these components in a single, completely integrated program. 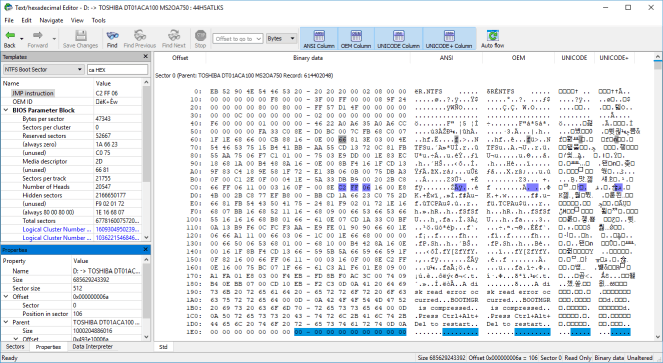 You may use the hexadecimal Viewer/Editor to browse through hard drives of a failed RAID to get its parameters, create images of those HDDs to always keep the original data intact, load those images, create a virtual RAID, scan this RAID to search for known file types, preview files to estimate data recovery chances, search and mark all files that you need to recover, specify all recovery parameters, and start data recovery. And do all that as one, single task within one program on a remote computer over a network. For all the feature richness you have with R-Studio, it is not a resource-hungry application. Its minimum system requirements are 256 MB of RAM and Win200. At the same time, it is optimized to run on the most advanced computer hardware and latest Microsoft operating systems. Please be warned: R-Studio is indeed a powerful and reliable data recovery software product, but it's not a miracle worker. It successfully recovers data that is present on hard disks. But if data has been overwritten, it is gone. Neither R-Studio nor any other data recovery software or data recovery professional can recover data in that event. Another special case is data recovery from a hard drive with hardware problems. You may use R-Studio to create an image of such a drive as soon as the drive shows the slightest signs of physical damage. 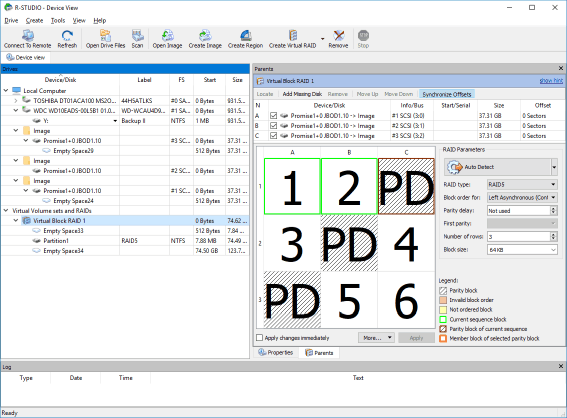 R-Studio even creates images in its Demo mode and saves them to another nondamaged device. Data recovery from images rather than the original drives is a very good practice to prevent irrecoverable data loss. When you bring a problem hard drive to a data recovery service company, hard drive image creation is the first thing the techs usually do. However, if your hard drive has a noticeable hardware problem (say, a grinding, scratching, or percussive sound), do not try to use R-Studio or ANY software. Instead, immediately turn off your system and disconnect the drive. DO NOT ATTEMPT TO TROUBLESHOOT IT YOURSELF! If your data is valuable, do not experiment with the hard drive; bring the drive to a qualified data recovery professional. An expert of this kind has special equipment to read data from the hard drive and create its image and, more important, has the necessary skills to work with such drives. No data recovery software, R-Studio included, will help you under these circumstances. Moreover, any tampering with a drive exhibiting these problems will surely inflict more damage on your data. And, alas, quite often the damage is fatal to it.